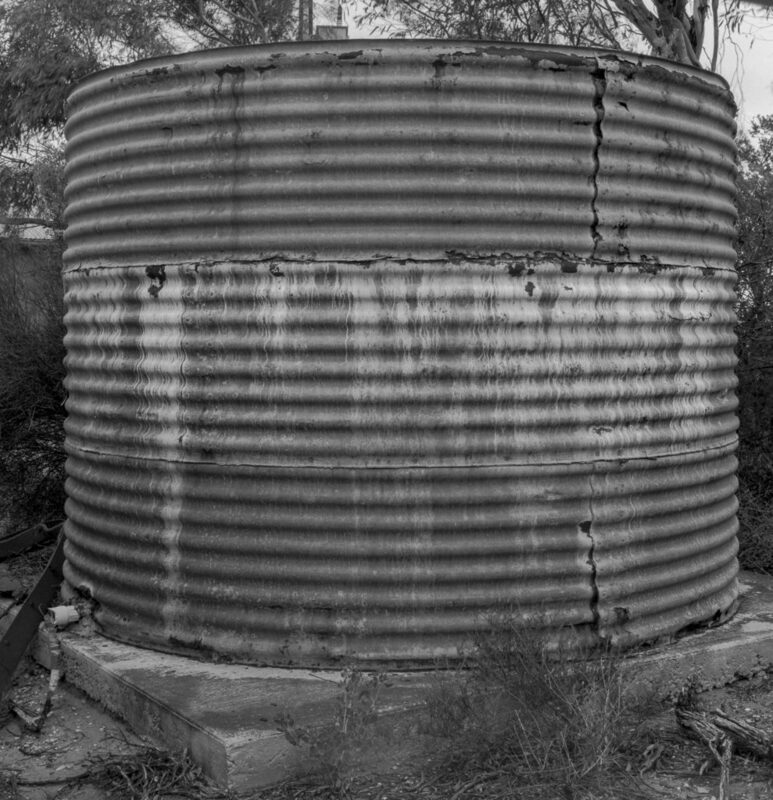 My black and white photography was marginal but I figured that black and white would work well representing the ruins of the family farms, soldier settlements and bores of the 20th century Mallee. This history was disappearing –eg., most of the older railway branch lines that had been used for transporting wheat had been pulled up in the 1990s, and there is little to no trace of these branch lines in the landscape in the 2nd decade of the 21st century. They are now different kinds of lines on old railway maps. So I purchased a light weight Sinar f2 because it offered more camera movements and more flexibility than the Linhof Technika IV that I was using for the colour work. I had only used it infrequently up until this trip as my eye wasn’t trained for black and white images and I didn’t have the darkroom facilities to process the 5×4 b+w sheet film at home. I decided to experiment with the Sinar whilst on the Wallaroo phototrip in 2016, as well as when I was exploring the Murray Mallee in 2017. I subsequently developed the 5×4 sheet film that had been exposed in Stuart Murdoch’s darkroom when I was in Melbourne on a recent photo trip. I was there to make some images for an exhibition on a changing industrial Melbourne at Atkins Photo Lab during the 2018 SALA festival. This was a slow start. Is it worth taking this 5×4 b+w experiment further in relation to the Mallee Routes project? I have decided in the affirmative. It would link with the past and to supplement the 5×4 colour photography. The common assumption is that digital colour photography is complete in itself and that black and white film photography is marginal. To supplement something is to add to it and to complete it. This implies that the thing being supplemented (colour photography) needs completion. There is an absence in what was supposedly complete or total. I slowly stated to upgrade the F2 to a Sinar P2 bit by bit and started acquiring the Patterson developing tanks and the chemicals that would allow me to develop the sheet film at home. I did not want to go back to a proper wet darkroom. Constructing a full blown wet darkroom was not an option. Neither was buying an expensive professional printer to print my own work for exhibitions an option. The black and white photography was a supplement. Now way to understand black and white film photography as a supplement to digital colour photography is along Derrida’s lines. A supplement for Derrida is simultaneously something that completes another thing, and something that may replace it, playing the role of substitute for it, and therefore, be a threat for it. The supplement is not an optional add-on to the original: it is the condition of the original. 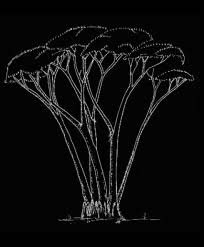 The supplementary is, behind its assumed peripheral importance, essential to all the ways in which we think. There is therefore an unstable equilibrium and thus a constantly shifting relationship which exists between colour and black and white photography. Each both replaces and supplements the other. Derrida uses the idea of the supplement to emphasize that there is no priority in these oppositions but only difference. 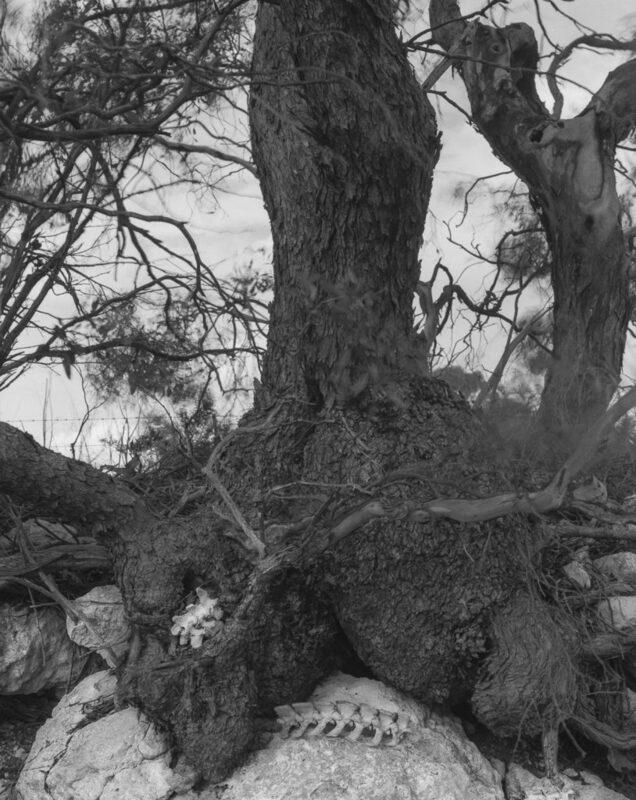 So black and white photography provides the means to disrupt entrenched ways of investigating and representing the Mallee.